It’s a new trading week, which means another batch of daily updates. So, how did the most recent hunt fare? Well, there was a beautiful uptrend that started last Friday and lasted for the whole of Monday. Sadly, both Variants weren’t able to ride the uptrend since there were no valid signals to go long. Boo hoo! Worse, there was one valid sell signal, but that ended up with a full loss. Boo hoo hoo! 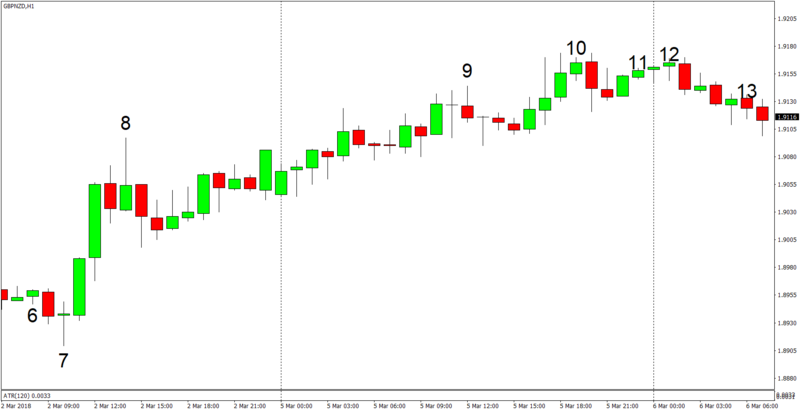 Also, if you’re wondering what the numbers on the charts are about, they refer to the trade #, based on the chronological order when the signal was generated, not necessarily when the trade was opened or closed. Note: Trades # 12 and 13 were triggered on March 6 and were therefore not included in today’s update, but they’ll show up in tomorrow’s update. There was a steady 260+ pip uptrend that started last Friday and lasted for the whole of Monday. Sadly, the Happy Hunter didn’t generate any long signals on Monday. Worse, there was one sell signal that got filled (trade #9), but that ended up with a full loss. Most annoying of all, the Trailing Variant’s bullish positions (trades # 3-7) from March 2 were all taken out at below their respective TP levels when trade # 8’s sell stop order was triggered. As such, the Trailing Variant failed to profit from that strong trend, even though the Trailing Variant was designed specifically to profit from that strong trend. Argh! This was the Trailing Variant’s chance to shine in order to make up for last month’s lackluster performance, and the market just won’t give the system a break. In an alternate universe somewhere, trades # 3-7 would have caught between 150-190 pips and the Trailing Variant would already be up by 6.67% for the month. But since we live in this universe, I just have to accept the fact that the system failed to profit from the strong uptrend. Oh, well. And besides, the uptrend is only clear in hindsight. 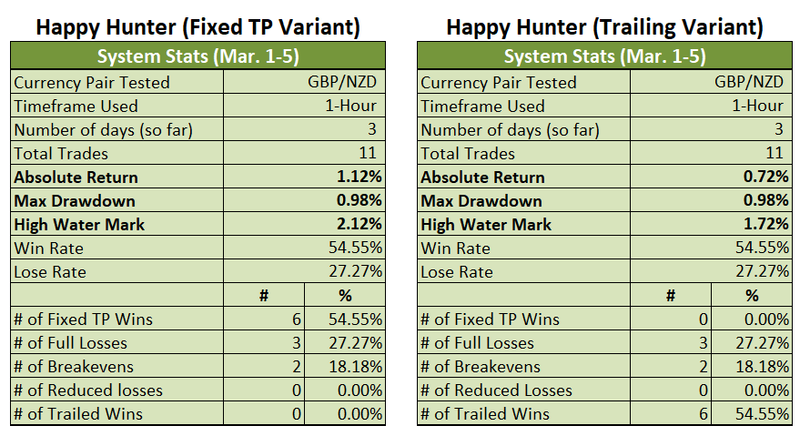 Anyhow, the full loss from trade #9 means that the Fixed TP Variant is now only up by 1.12% for the month of March (+1.62% previously). 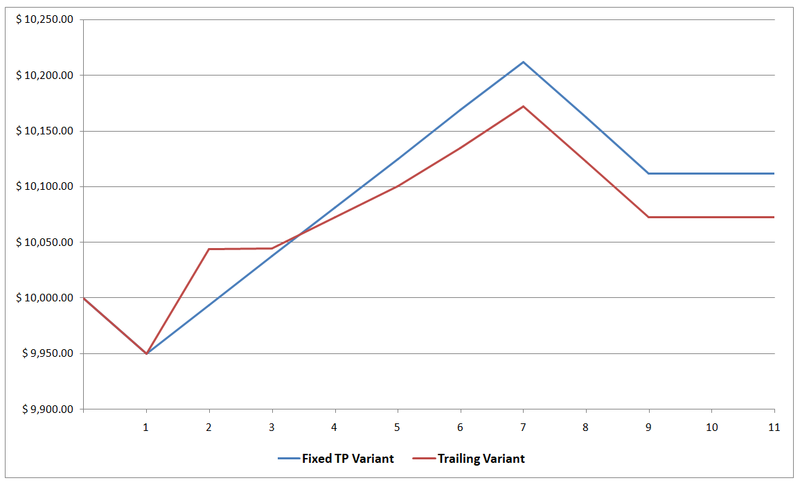 The Trailing Variant, meanwhile, is still up by 0.72% (+1.22% previously). Okay, that’s all for today. And as always, I enjoy your feedback, so if you have any questions, or if you found a possible error somewhere, or if you just want to say “hi”, then don’t be shy and write a comment down below!